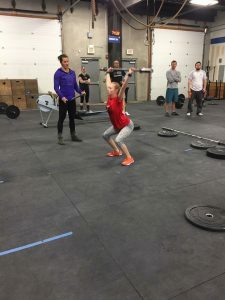 How did you hear about CrossFit? 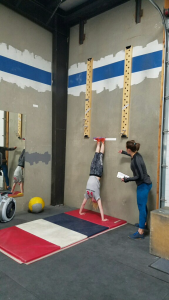 I heard about Crossfit because my mom and dad do CF. How has CrossFit changed your life? CrossFit has changed my life because I am more confident and am stronger than I have ever been. My favorite movements are rope climbs and toes-to-bar. My least favorite movements are rowing and wall balls. Family info My family is my dad Dana, my mom Shelly, and my big brother, Peyton. We also have 2 dogs, Clancy and Josie. Something interesting about me. Something interesting about me is I am a homebody. I basically only like going to the gym and the horse barn where I lease a horse named Star. Favorite songs to work out to I like working out to any songs that have a good beat. Favorite TV show or movie My favorite TV show is Heartland. What movement or skill were you most excited about when you were able to do it? 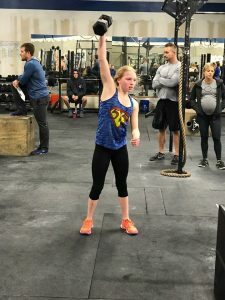 The movement I was most excited about when I learned how to do it was double-unders! Way to go, girl! You are amazing! What an AWESOME accomplishment. I am so proud of you Justice. You amaze me all the time! Congrats Justice! Keep it up! Good work! I hope my daughter does Cross fit someday too!